Hello! I’m still alive, just too busy to blog. But I had to announce this! The publication of the newest Just-Us League anthology, Secrets in Our Cities. This paranormal urban fantasy anthology features tales of our favorite supernatural creatures. And just take a look at this gorgeous cover done by Louis over at Indigo Forest Designs. 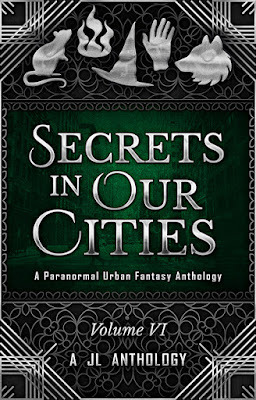 The real world and imagination collide in this international collection of paranormal urban fantasies. Husband of Mine got offered a job in Utah, and he accepted. We had about 3 weeks to pack up everything and move 700 miles away. During this time, A Bit of Magic was released, and I didn’t really get to do anything to celebrate my third publication because I was busy. We spent a weekend out in Utah looking for a house. On our way, we were in a car accident and our car was totaled. We only owned the car for 3 1/2 months. We continued on our way to Utah, found a house and put an offer in, then went home. Offer was accepted on the house and we finished packing to move. We drove up by ourselves with all our stuff loaded in a van, and spent three nights in a temporary apartment while we closed on the house and signed the paperwork. Then we moved into our new house. It took about 3 weeks to fully unload everything except for our office which hasn’t been finished because the movers who loaded our truck broke our desk, which is in pieces in the garage. So we’re waiting to fix the desk so we can unload the boxes for that room. I started plotting my Camp NaNoWriMo piece. Today is May 31st, that means it's release day for my third publication in A Bit of Magic: A Collection of Fairy Tale Retellings. Get it now on Amazon! Welcome to my stop on the A Bit of Magic blog tour. My special guest of honor is Rebecca Mikkelson! 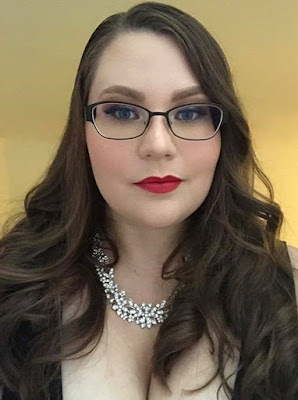 Rebecca Mikkelson has been writing fantasy stories since her early teens for fun and is thrilled to turn her dream into a reality. She currently lives in Hawaii with her husband of six years where they enjoy not going outside and avoiding the scare ball in the sky. In her spare time, she likes to cross stitch to relax. Rebecca Mikkelson is Chief of Business Development at Authors 4 Authors Publishing - a publishing company run by authors, for authors, blending the best of traditional and independent publishing. Rebecca, I’m so excited to hear about your story, especially since this is your first publication. Let’s get right to it. Q- What inspired your retelling? It’s time to announce Secret Project #2! And yes, it’s another fairy tale retelling. I’m very excited to announce the publication of Cursed Winds, my Beauty and the Beast retelling. I’ve been holding onto this idea since Disney released their live-action Beauty and the Beast movie. It left me with a lot of questions that I wanted answered, so I decided to write my own version of the tale, which I never thought I would do. And yes, it involves pirates. 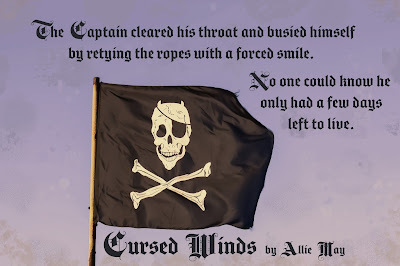 Cursed Winds will be released on May 31st in the fifth JL Anthology, titled A Bit of Magic. Stay tuned for a cover reveal, coming very soon! My big goal for Camp NaNo was to write an average of 500 words a day. Well, it was to write 15,000 words during the month, but that averaged out to 500 words a day. So... 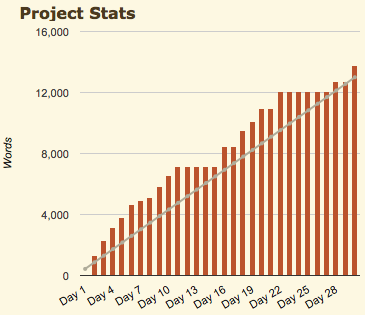 I didn't quite write 15,000 words this month. But I spent the last week of Camp NaNo sick with the stomach flu (hence that lovely flatline toward the end), so I took out the 4 days I was sick and altered my goal to be 2k less than it was originally. So technically, I didn't hit my goal, but also I did. Allie May is on Amazon! 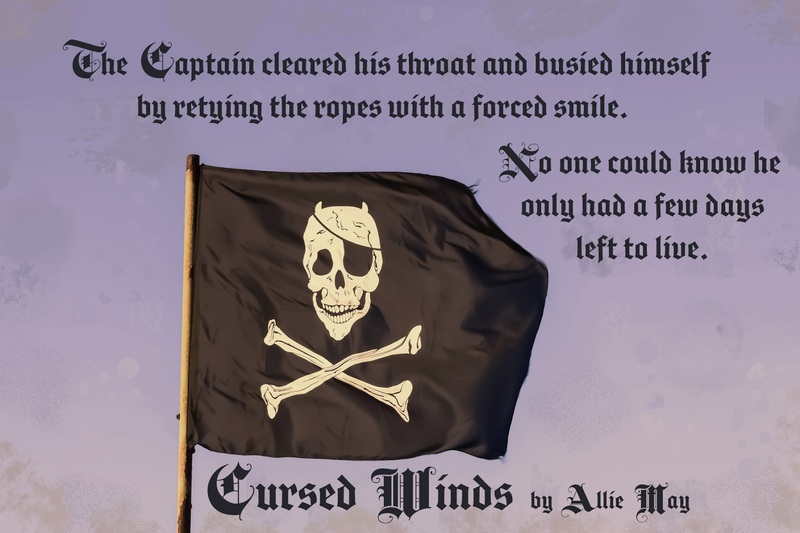 Allie May is on Goodreads! Allie May is on Facebook! Allie May is on Twitter!